The Gardner Machinery Corporation (GMC) Overhead Monorail System is an all-welded construction, braced to limit deflection and sway in accordance with Monorail Manufacturers Association specifications for overhead track systems. GMC has the expertise to install a monorail system correctly and weld it in place on rigid hangers, resulting in reduced labor for both maintenance and operating personnel. Systems hung from threaded rod and bolted assembly require frequent inspection for loosening fasteners and rail that gets out of position, resulting in trolleys that do not roll. Trolleys that do not roll equate to loss of productivity. GMC rails are made of high carbon steel which is homogenous throughout the material instead of having just a thin layer of carbon steel on the surface, as in case hardening. Wear and deformation of the rail is not an issue with our system as it is with aluminum, stainless steel, or mild steel. 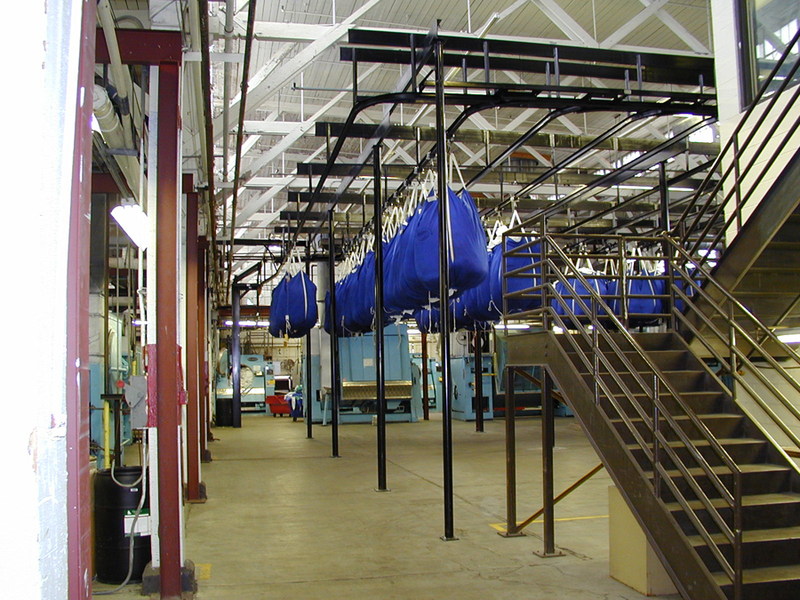 From start to finish, all the components of our monorail system are the heaviest and the most ruggedly built in the laundry industry. Our 3” “I” beam weighs 5.7 lbs. per foot. Some GMC systems are working in excess of thirty (30) years. GMC monorail systems use gravity and compressed air as energy sources. 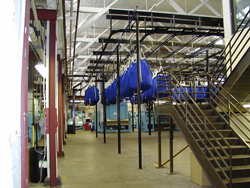 In fully automatic systems AUTOMATIC SLING OPENING AND CLOSING devices are used as needed. In the operation of our user-friendly monorail system designated items may be immediately delivered to a specific processing station by merely pressing a button. All components of GMC monorail systems are equipped with the necessary safety interlocks.